The federal government and Albertsons have taken steps that could lead to settlement of a lawsuit over an alleged policy at the San Carlos store to keep employees from speaking Spanish to customers. Last month, San Diego federal Judge Michael Anello granted the grocer and the Equal Employment Opportunity Commission a delay in the civil rights case. Albertsons had been facing an Aug. 23 deadline to respond to accusations that the grocery store violated federal law when some Hispanic employees were subjected to harassment and a hostile work environment amid a no-Spanish policy. But on Aug. 20, Anello set an Oct. 22 deadline for the response. 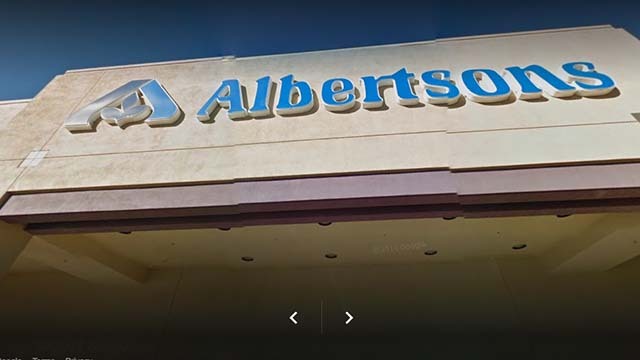 Zadravecz said in a court filing that the EEOC agreed to provide a draft of certain settlement documents that may be required to resolve the case as well as an initial settlement demand for Albertsons to consider. On Wednesday, a regional attorney for the EEOC’s Los Angeles District (which includes San Diego) declined comment on the status of settlement talks. “Unfortunately we cannot [disclose] or comment on settlement issues under the federal rules of civil procedure,” said the attorney, Anna Park. Lawyers for Albertsons did not respond to a Times of San Diego request for comment. The joint motion provided a clue on why the EEOC might want to settle before trial. During the Aug. 16 conference, said the grocery company’s lawyers, the parties discussed Albertsons’ proposed motion to dismiss the EEOC’s complaint for failure to state a claim pursuant to Federal Rule of Civil Procedure 12(b)(6). 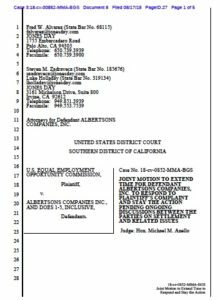 According to the original suit, filed May 3, the Albertsons store on Lake Murray Boulevard near Navajo Road in late 2012 began prohibiting employees from speaking Spanish around non-Spanish speakers, including when they spoke to Spanish-speaking customers and during breaks. The EEOC alleged that Albertsons managers at the San Carlos location publicly reprimanded Hispanic employees caught speaking Spanish. The EEOC also contended that no corrective action was taken, despite numerous employee complaints, forcing employees to transfer to other stores. In a training video, managers and employees were instructed that employees should not speak Spanish as long as a non-Spanish speaking person was present, the suit said. In 2012, the suit said, store director Richard Brown and other supervisors told employees Guadalupe Zamorano, Hermelinda Stevenson and other Hispanic staff that they could not speak Spanish anywhere on the premises regardless of whether they were on break. In July, an Albertsons spokeswoman said: “While we cannot comment on this pending litigation specifically, Albertsons does not require that its employees speak English only. Albertsons serves a diverse customer population and encourages employees with foreign language abilities to use those skills to serve its customers”.